AUTEUR ARIEL: What is sleep? The word 'sleep' has been rare and sparse this past weekend. On Friday, a bunch of us went over to Bri's house to carve pumpkins, roast marshmallows, and celebrate Jessica's completion of her anatomy test that she's been studying foreverrrrr for. We all ended up staying there till 4am. 4 IN THE MORNING. I don't remember the last time I stayed out that late since we've been married, but when you're in good company, having a blast playing N64, and ordering spontaneous pizza at 2am, it happens. We then continued the late night spree to Saturday when we went to a Halloween Party and stayed partying till 2am. Cus I'm having trouble finding it or knowing what it is. Anywho, today's outfit is a fun one because it involves two super dupers. These super duper comfy pants and this super duper cute scarf. These Take a Hike Pants from Tobi are like liquid on your legs... which I know sounds really weird but I promise it's a good thing. They're one of those pants that you can wear out and about and feel stylish, yet when you come home you can keep them on for lounging cus they're that comfortable. Get yourself a pair and I promise your legs will thank you. 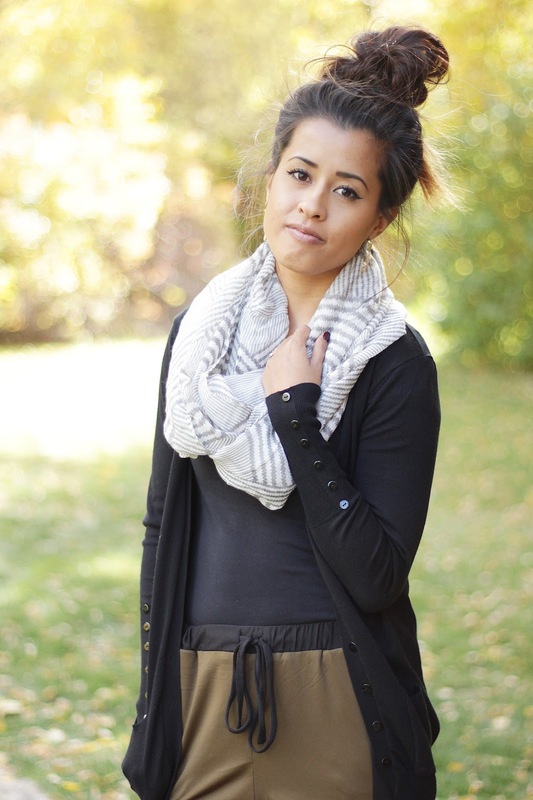 This Striped Pattern Infinity Scarf from Lemon Drop Boutique is too adorable for words. It's the perfect accessory to add to a simple outfit to spice it up a little! Love this look! Your top knot is perfect! The vintage leaves ring is beautiful! I love the Vintage Leaves Ring! Oh, those pants are amazing. Love the styling! I love all their scarves, but my favorite is the Flower Print Infinity Scarf. I really like the Abstract Printed Infinity Scarf! Thanks for the chance! There are so many pretty pieces. I think if choose the Crystal and Pearl Layered Necklace. Thanks for this opportunity. the vintage leaves ring. yay fall. thanks! I love the geometric floral infinity scarf! love the scarf youre wearing! I'm in love with the carved feather bracelet! I like the Peacock Fashion Scarf. Love the Retro Jewel Necklace! I like the Leopard Print Infinity Scarf. Love the scarf you have on. Hello! I'm loving your messy bun! My favorite item is the Crystal & Pearl Layered Necklace. So pretty. Thank-you!! I love the Retro Jewel Necklace! My favorite item from Lemon Drop Boutique is the Envelope Statement Necklace. I'm loving your entire outfit - it looks so comfy! Also, your messy bun is so spot on - I'd never be able to make it look that good but it looks great on you. Found your blog through a link-up and I'm loving all of your outfits - I'll definitely be bookmarking it! I love the triangle stone ring! My favorite is the striped pattern infinity scarf! I love the pearl statement necklace! I love the Antique Necklaces! So pretty! My favorite is the Cut Out Heart Ring. I like the striped pattern infinity scarf! love the gold leaf ring!! Emerald City Necklace is gorgeous.